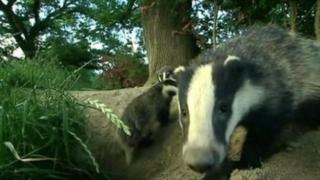 The policing of badger culling cost taxpayers more than £3m last year, new figures show. The government has allowed culling in 32 areas across 10 counties in England to tackle Bovine tuberculosis. Devon and Cornwall Police spent the most of any force at £800,276, followed by Cheshire Police's £484,892 bill. A spokesman for the Department for Environment, Food and Rural Affairs (Defra) said the "average cost" of policing has "declined significantly". He said Bovine TB "is the greatest animal health threat to the UK and costs taxpayers more than £100m each year". Police forces are paid for the work by Defra, which released figures showing 32,601 badgers were culled in 2018. The government is also considering other methods of eradication. Cheshire West and Chester Council approved a badger vaccination programme last November, while a volunteer-run Cheshire Badger Vaccination Programme is also in operation. The government's been awarding licences to cull badgers, usually to groups of local farmers, since 2013. Since then the cull has spread across England as licences have been extended. But the practice is extremely controversial with patrols of campaigners protesting against it or trying to stop it, and police are often called in. Officers are asked to investigate allegations of wildlife crime as well as violence and intimidation from both sides. For those who've protested against the cull for the last six years, the policing cost is thought of as a huge waste of money. And for those backing the cull, it's a necessary way of facilitating the fight against what the government says is "the greatest animal health threat to the UK". A spokesman for campaign group Wounded Badger Patrol said he "saw at first-hand the extensive police operation", which "is a very wasteful use of local taxpayers' money". "This is all very expensive police time and equipment being used to police a deeply unpopular, unethical, unscientific and ineffective cull." He said there is "now a fully-functioning" vaccination programme and "absolutely no need for farmers and landowners to sign up to culling badgers". A Defra spokesman said: "Our comprehensive strategy to eradicate it includes tighter cattle movement controls, more cattle testing and badger control in areas where the disease is rife."